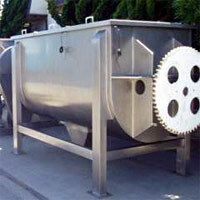 We manufacture blenders which are been used for mixing the different materials. These blenders are been used in the food and chemical industry for mixing up the different liquids. The capacity of these blenders manufactured by us is upto 10000 liters. We manufacture these blenders with the quality stainless steel and the mild steel. These blenders are been manufactured as per client's specifications and design requirements.